Following is a brief description documenting the flow of misinformation and deceit, beginning at the Source and ending with Avaaz’s campaign for NATO/US attack on Syria. The “Source” is unknown at this time. It might be some US agency with or without the approval of the Obama administration. Or it might be another foreign government which seeks, in plain violation of international law, the overthrow the Syrian government. In addition to the U.S., Turkey, Saudi Arabia, France, Britain and Qatar have each spent hundreds of millions and even billions in heavy weaponry plus 3,000 tons of weapons via Croatia plus arming, training, supplying and paying the salaries of thousands of domestic and international mercenaries sowing mayhem and destruction in Syria. At this point we do not know but there is a REWARD: $100 finders fee to the first person who can provide credible evidence identifying the SOURCE. This is an international PR firm. CEO is Jeremy Heimans, a co-founder of Avaaz. In this case the “problem” is reluctance to take over Syrian skies and land. For a hefty fee, “Purpose” will dupe the public and break down that reluctance. Toward that end, Purpose created “The Syria Campaign”. The Syria Campaign began in spring 2014. One of their first efforts was to work to prevent publicity and information about the Syrian Presidential Election of June 2014. Accordingly, “The Syria Campaign” pressured Facebook to remove advertisements or publicity about the Syrian election. Since then Syria Campaign has engineered huge media exposure and mythology about their baby, the “White Helmets” using all sorts of social and traditional media. The campaigns are largely fact free. For example, the Syrian election was dismissed out of hand by them and John Kerry but taken seriously by many millions of Syrians. The Syria Campaign is managed by Anna Nolan, who grew up in northern Ireland and has very likely never been to Syria. In addition to promoting the White Helmets, Syria Campaign promotes a new social media campaign called “Planet Syria”. It features emotional pleas for the world to take notice of Syria in another thinly veiled effort pushing for foreign intervention and war. According to their website, The Syria Campaign received start-up funding from the foundation of Ayman Asfari, a billionaire who made his money in the oil and gas services industry. But White Helmets primary function is propaganda. White Helmets demonizes the Assad government and encourages direct foreign intervention. 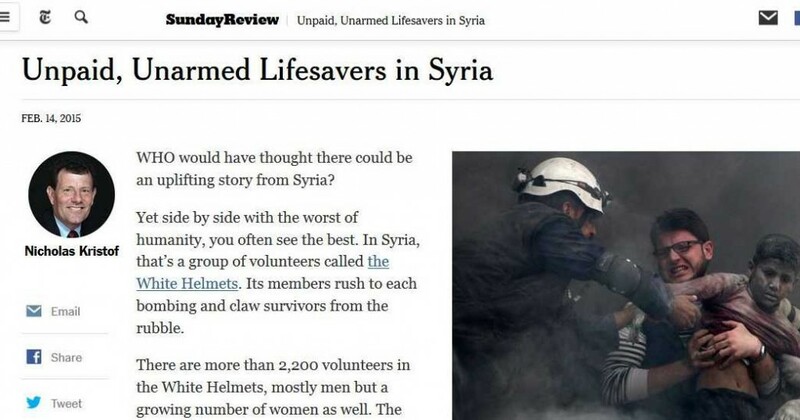 A White Helmet leader wrote a recent Washington Post editorial. White Helmets are also very active on social media with presence on Twitter, Facebook etc. According to their website, to contact White Helmets email The Syria Campaign which underscores the relationship. 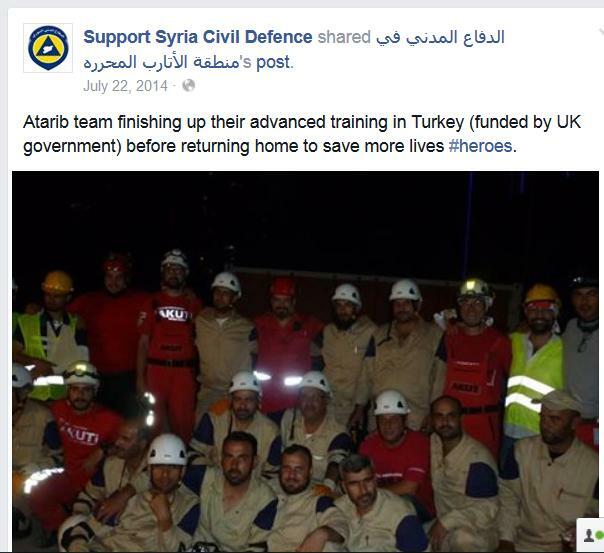 The “White Helmets” campaign has been highly successful because of uncritical media promotion. 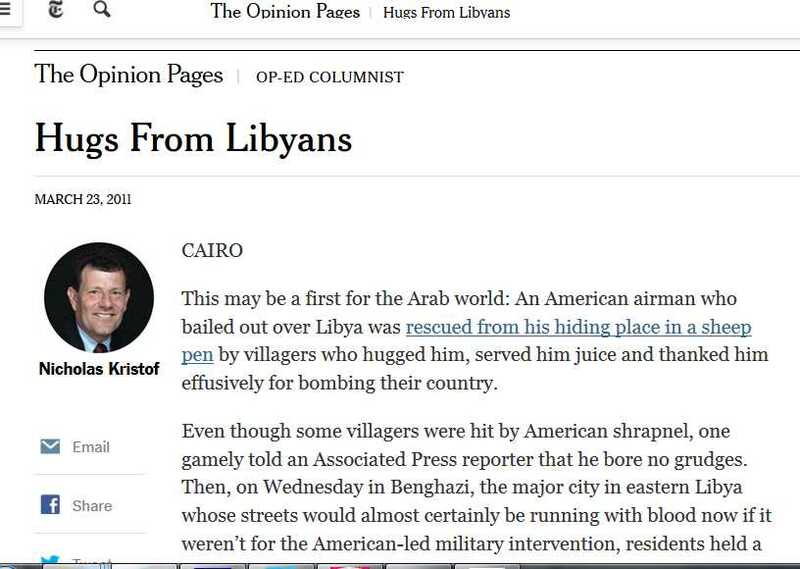 Nicholas Kristof of the New York Times was an advocate of the NATO/US attack on Libya. According to him, villagers who had been shot, injured and their homes destroyed were not bitter, they were thankful! . “Hugs from Libyans” is how he viewed it. It was, of course, nonsense, helping to pave the way in the invasion and destruction of the country. Now Kristof is uncritically promoting the White Helmets, aiding and abetting their political and propaganda message seeking foreign intervention in Syria. Avaaz is an online lobby organization founded in 2007 by Jeremy Heimans (now CEO of Purpose) and others. Start-up funding was provided by George Soros’ foundation. While Avaaz has promoted some worthy causes, they have been prominent in promoting neoliberal foreign policies in keeping with the U.S. State Department. Accordingly, they had a major disinformation campaign against Venezuela last year. Avaaz very actively promoted a No Fly Zone in Libya. They are now very actively promoting the same for Syria. In-depth research and exposure of Avaaz can be found here. The titles give some indication: “Faking It: Charity Communications in the Firing Line”, “Syria: Avaaz, Purpose & the Art of Selling Hate for Empire”, “Avaaz: Imperialist Pimps for Militarism”. 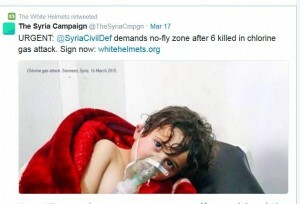 Avaaz justifies its call for No Fly Zone in part on White Helmets. 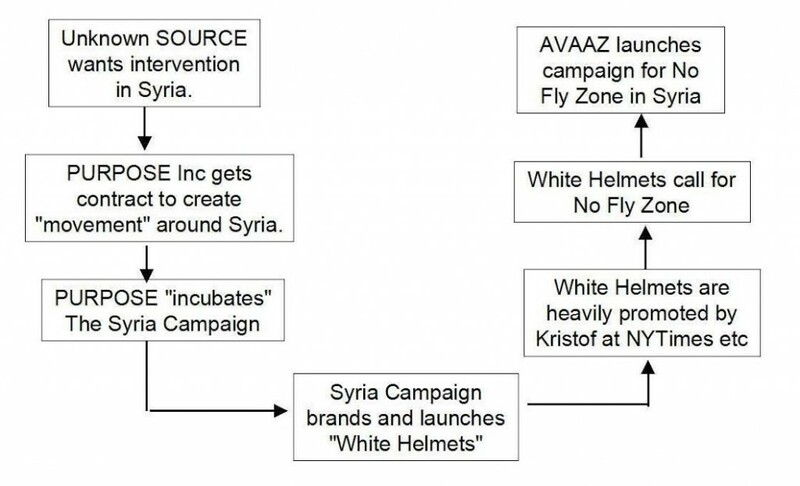 Given the close interconnections between Avaaz and Purpose, they are surely aware that White Helmets is a media creation. This calls into question their sincerity. The manipulators rely on emotional images and messages, not facts. They depend on willing partners in the mainstream media who amplify the easy and glib characterizations of who and what is good and bad. The manipulators depend on their audience not asking questions or investigating on their own. In these times of rapid spread of visual and text information via social media, the potential for deceit is huge. This article was posted on Thursday, April 9th, 2015 at 10:56pm and is filed under Disinformation, Libya, Media, Mercenaries, Propaganda, Qatar, Saudi Arabia, Social media, Syria, Turkey, Weaponry.